This course covers techniques, rope-work and protection for climbing water ice and is perfect if you want to get into this ‘dark side’ of the sport. Is there is a route that has captured your imagination, a mountain you’ve seen or a summit you’ve always dreamed of reaching? Please get in touch to discuss your ideas and I’ll help you to achieve this every step of the way from preparation through to the end of your trip. Dreaming of climbing perfect water ice under blue skies? This is all about maximum enjoyment and pumped forearms climbing classic icefalls in Europe. We will aim to climb Mont Blanc by the classic Gouter Route. Although there are many routes to the summit it is the most straightforward and our objective for the week. If interested in alternative routes to the Alps’ highest peak then look at the Mont Blanc the Hard Way course. The main climbing season is between June and September. June and September are quieter than July and August which are the peak (pun intended) months and can be quite busy. We take the Bellevue cable car from Les Houches then the funicular railway to reach the Nid d'Aigle at 2367m. Here we walk up mountain paths where you frequently see Bouquetin (Alpine Ibex) which steepen and lead to the small Tete Rousse Glacier which is crossed to the Tete Rousse hut where we’ll most likely spend the night. Above the hut we’ll get our mountaineering kit out and cross the Grand Couloir before scrambling up the rocks of the Aiguille du Gouter to reach the Gouter hut (3800m); from here the route is all on snow. The climb makes its way up the glaciated slopes of the Dome du Gouter (4304m) where you first see the upper mountain above. We pass the emergency shelter of the Vallot hut (4362m) where the route steepens up the splendid Bosses Ridge, which is a fairly narrow and at times exposed snow arête. Above here you’ll reap the benefits of your training and preparation as the air gets thin and you feel the altitude. After carefully climbing up the ridge we gain the summit of Mont Blanc (4810m) and the pinnacle of our week. DAY 1: Meet at 0900 in Chamonix for the trip briefing, provision of hire kit and equipment check. We’ll have a short time to do any last minute shopping and grab lunch before driving through the Mont Blanc tunnel into Italy and the beautiful Gran Paradiso National Park. A 3 hour walk up steep mountain paths through delightful Alpages lead to the Chabod Hut (2750m) where we’ll spend the night. DAY 2: An early pre-dawn start is needed for the 1300m ascent of Gran Paradiso (4061m) which is mainly a straightforward glacier climb with an exposed ridge scramble up the final metres to the summit Madonna. This is good training and acclimatisation and typically takes 6–8 hours. Return to the hut for a second night to aid acclimatisation. DAY 3: Descend to the valley and return to Chamonix. Relax and recover ready for your Mont Blanc ascent. DAY 4: Take the cable car and train to the Nid d’Aigle (2367m) followed by a 3 hour hike up steep rocky paths to reach the Tete Rousse hut. Get an early night ready for the big day. DAY 5: An early start of 0400 is needed from the Tete Rousse hut so we reach the Grand Couloir at daybreak. We cross this then scramble up the rocks of the Aiguille du Gouter to reach the Gouter refuge (3800m). We’ll leave a small amount of overnight equipment here before continuing the ascent over the Dome du Gouter and up the steep Bosses ridge to gain the summit with its spectacular views across the Alps. Carefully descend back to the Gouter refuge. Typically 8 hours. DAY 6: Descend to the valley to celebrate! If we’ve been unable to summit on Day 5 this is also a contingency summit day with a very early start. This is an example itinerary and is subject to change depending on prevailing weather, refuge availability and mountain conditions. Suitability: This course is designed to prepare you for the rigours of climbing Mont Blanc – although previous mountaineering experience is beneficial it is not a pre-requirement. However climbing Mont Blanc is not easy, the course will be very physically demanding so you should be prepared for six days in the mountains ascending up to 1800 vertical metres on the summit day whilst carrying a pack. Mountainous day hikes carrying a pack or long bike rides of 3 hours or more will help build endurance – if you have any questions about training for Mont Blanc then please get in touch. Ice axe, crampons, harness and helmet can be provided for a hire fee of £12/€15 per day. Mountaineering boot hire can be arranged with Snell Sports in Chamonix. We will aim to climb Mont Blanc by an alternative to the classic Gouter Route. There are many routes to the summit of different character and difficulty but all of them are classic outings amongst the best in the Alps at their respective grades. Have a look at the following suggested routes and get in touch to ask questions or make a booking. All bookings on these courses are private and can be run from May through October depending on conditions. This used to be one of the most frequented routes on Mont Blanc as it is a very picturesque traverse over Mont Blanc du Tacul (4248m) and Mont Maudit (4465m) then past the spectacular col Brenva up to the summit. Due to glacial changes in recent years the route has become steeper and more serious and in 2017 the guiding ratio was lowered to 1:1 for this route. Under the right conditions it provides a spectacular way of reaching the Alps’ highest summit and when combined with the Gouter route a fine horseshoe traverse. Dave on the Pope Route. The Aiguille du Bionnassay traverse climbs the very narrow crest in the background. The normal route from the Italian side of the mountain is long and remote without the benefits of mechanical uplift like the French side. As such it is less frequented and is a satisfying mountaineering adventure especially when combined with a descent down the Gouter route to Chamonix making a traverse of the mountain. This is a splendid and committing high mountain odyssey which traverses the skyline view as seen on the approach towards Mont Blanc down the Arve valley. Starting from the village of Les Contamines-Montjoie without lifts we traverse the Dome de Miage to reach the remote Refuge Durier (3358m). The traverse continues over the Aiguille de Bionnassay (4053m) where the summit ridge is one of the most impressive narrow and exposed snow crests in the Alps - only perfect crampon work will do. This brings us past the Piton des Italians to the final climb up the Bosses ridge to the summit of Mont Blanc (4810m). Descent can be via the Trois Monts route to the Aiguille du Midi or down the Gouter Ridge. This is a long and demanding Alpine day which rewards good fitness and preparation. A remote and committing climbers’ route to the summit of Mont Blanc from the Italian side. We climb through some of the most chaotic glaciated terrain in the Alps to gain the Col Eccles (4000m) before climbing excellent granite, steep snow crests and mixed ground to reach Mont Blanc de Courmayeur. In true style we then traverse over the summit and descend into France. The big one. Literally, this is the longest ridge and route in the Alps with a cumulative ascent of nearly 4500m and is a rarely completed and serious undertaking. Seen from the Skyway lift in profile the ridge is a compelling line and undoubtedly one of the finest in the Alps with technical difficulties on both rock and mixed terrain. The ascent climbs over the rocky towers of the Aiguille Noire de Peuterey (3772m) before making some of the most exposed abseils in the Alps to regain the ridge which leads over the steep snow crest of the Aiguille Blanche de Peuterey (4112m). The final hurdle is ‘just’ the 800m climb up the seriously exposed upper Peuterey ridge to the summit of Mont Blanc before descending the French side. Three long days and two bivouacs are the norm! The ski ascent of Mont Blanc via the Grand Mulets route is described in the ski section. The Matterhorn is truly an iconic summit and one known by many non-mountaineers worldwide. If you asked a child to draw a mountain they would likely draw something similar to this steep rocky pyramid that looms over Zermatt. Not only is it the world’s most photographed peak but it’s also the ‘Toblerone Mountain’. This course will prepare you for the 1200m summit climb with 3 days of technical training and acclimatisation around the Mont Blanc Massif before heading to Zermatt and the Hornli Hut below the famous Hornli Ridge. The ridge rears up steeply behind the hut where a fixed rope helps us to get up the initial steep rock wall to ledges. From here the route follows a system of ledges and gullies on the East flank of the ridge with continuous and sustained scrambling leading to the Solvay Hut (4003m) – a small emergency shelter. Above the Solvay hut we scramble to the shoulder and climb some steeper sections where in places there are fixed ropes to aid going up and down. The final section to the summit is on mixed terrain where careful crampon work is required to reach the summit (4478m). Ideally we want most of the section below the Solvay to be quite free of snow as it greatly hinders progress up the lower peak. As such the best time of year for an ascent is in July and August. Daniel on the summit of the Matterhorn! DAY 0: Travel to Chamonix. Meet at 1900 in Chamonix for the trip briefing, provision of hire kit and kit check. DAY 1: We’ll head out locally onto a technical training route to practise moving efficiently over rocky terrain and get warmed up for the week ahead. The traverse of the Perrons on the Swiss border is a perfect candidate for today with lots of scrambling, some climbing as well as some abseils and lowers to get used to the ropework required. Typically around 8 hours. DAY 2: We’ll take the Mont Blanc tunnel through to Italy and use the Skyway lift to get access to the high mountains on the Italian side of the Massif. There are several good training peaks on this side, the Marbrees, Entreves and Tour Ronde Freshfield arête being good training at altitude. We’ll spend the night at the Torino Refuge (3375m). DAY 3: A second training route at altitude before descending on the Skyway and returning back to Chamonix. DAY 4: We’ll travel over to Tasch and take the train to Zermatt before using the uplift system to get to Schwarzee. Here we’ll walk in to the Hornli Hut and may make a quick recce of the lower part of the ridge in the afternoon to prepare for the next day’s climb. DAY 5: An early start at 0330 means we’re climbing the lower section of the mountain by headlamp but this is rewarded when the sun comes up and we’re already a long way up the ridge. We’ll keep pushing up the Hornli ridge to gain the Swiss summit before traversing the exposed crest between the Swiss and Italian summits before returning back down the route to the hut. This isn’t to be underestimated and it frequently takes longer to descend the ridge than to climb it! 9–12 hours. DAY 6: Return to the valley and drive back to Chamonix to celebrate your climb. This day can also be used as a second summit day if the weather or conditions don’t allow it on DAY 5. The Matterhorn can also be climbed via the Lion (Italian) Or Zmutt Ridges with a descent down the Hornli making a traverse of the mountain. Please get in touch if you’re interested in alternative Matterhorn routes including the North Face Schmidt Route. Suitability: This course is designed to prepare you for the challenge of climbing the Matterhorn. Previous mountaineering experience is essential with the ability to move efficiently on broken mixed terrain the key to success. Climbing the Matterhorn is not easy! The course will be very physically demanding so you should be prepared for six days of climbing technical terrain in the mountains ascending up to 1300 vertical metres in a day whilst carrying a pack. Mountainous hikes and scrambles carrying a pack or long bike rides of three hours or more will help build endurance and improve your technical skill – if you have any questions about training for the Matterhorn then please get in touch. With its famous north face the Eiger (Ogre in Swiss German) is one of the most recognisable and famous summits in the Alps, if not the world. Luckily for the mortal alpinist the peak sports two ridges of different characters; both of which make for superb expeditions and are among the finest at their grades in the Alps. There are several variations to this trip so we will work with the conditions in the mountains to give us the best chance possible of reaching the summit. Ideally on this trip we will aim to ascend the Mittellegi ridge and descend either the West Flank or the South ridge to the Monchjoch, both routes traversing the mountain. We can also make the ascent via the South ridge and West Flank or return back to the Monchjoch via the same route. Although not a traverse this ridge has a wild and remote feel and is a highly prized ascent. DAY 0: Travel to Interlaken. Meet at 1900 in Interlaken for the trip briefing, provision of hire kit and kit check. DAY 1-3: We’ll head up the famous Jungfraujoch railway (which travels through the Eiger) into the stunning Bernese Oberland where we will make some preparatory climbs to get acclimatised to the altitude and ensure that we are moving efficiently over mixed high mountain terrain. Possible climbs may include the Monch (4107m), Jungfrau (4158m), Gross Grunhorn (4049m) and Trugberg (3933m). These days will be run at a ratio of 1:2. DAY 4: We’ll return to the Jungfraujoch railway and the Mittellegi or Monchjoch Hutte depending on our chosen route, meet the second guide and get an early night. DAY 5: Summit day. Make an early start for either the rocky Mittellegi ridge or a snowy glaciated approach to the South ridge before our intended climb. Descend to Kleine Schiedegg or return to the Monchjoch Hutte. DAY 6: Contingency summit day or we can make the most of an extra day by doing some local climbing or a day trip from the Jungfraujoch before heading back to Interlaken to celebrate. Suitability: This course is designed to prepare you for the challenge of climbing the Eiger. Previous mountaineering experience is essential with the ability to climb UIAA 4+ on rock in big boots, move efficiently over tricky mixed terrain and safely along exposed snow crests. This is a serious and committing undertaking and will both very physically and mentally demanding. You should be prepared for six days of climbing technical terrain ascending up to 1300 vertical metres a day whilst carrying a pack. Aerobic fitness and endurance is crucial for long days in the high mountains. Mountainous hikes and rocky scrambles carrying a pack and long bike rides or runs up to 3 hours or more will help build endurance and improve your technical skill. If you have any questions about specific training for the Eiger or to climb other routes including the classic North Face 1938 route please get in touch. Ice axe, crampons, harness and helmet can be provided for a hire fee of £12/€15 per day. Mountaineering boot hire can be arranged in Interlaken or Grindlewald. The Mont Blanc massif is home to some of the best mountain rock climbing on earth and has been a proving ground for generations of climbers. Whether you are a mountaineer wishing to sample some more technical climbing or a seasoned rock climber wanting to tackle an Alpine rock climb there are amazing climbs at all standards. Some example routes we might climb on this course include: Aiguille du Moine, South Face, 10 pitches (F4b) or South Ridge, 8 pitches (F5c); East Ridge, Pyramid du Tacul, 9 pitches (5a); The Frison-Roche, Brevent, 6 pitches (F6a); The Papillons Arête, Aiguille de Peigne, 15 pitches (F5c); Rebuffat-Baquet, Aiguille du Midi, 9 pitches (F6a); Nabot Leon, Aiguille de Blatiere, 7 Pitches (F6a) or even Banana Republic, Aiguille de la Republique, 24 pitches (F6c) amongst many others. If desired this course can be extended at request. Suitability: This course is all about the rock climbing so previous climbing experience is useful. If you are unsure or have any questions then please get in touch. This course can be catered to suit all abilities and experience levels. Typically the routes we climb will sit between F4-F7a (HS-E4) grade ranges. As some routes require a glaciated approach some mountaineering experience is beneficial but it is not a pre-requirement, necessary crampon and ice axe skills or a refresher can be linked into the course. Ice axe, crampons, harness and helmet can be provided for a hire fee of £12/€15 per day. Mountaineering boot and rock shoe hire can be arranged with Snell Sports in Chamonix. New to Alpine climbing and not sure where to start? This introductory level three day course will teach you the basics of Alpine climbing and staying safe in the mountains. Day 0: Arrive in Chamonix, pre-course briefing and kit check at 1900. DAY 1: Ecole de glace. We make use of the uplift system to head up onto glaciated terrain to learn how to safely and efficiently travel in the mountains. Starting with crampon technique we’ll practise moving on snow and ice before roping up for glaciated travel and going on an introductory journey where we will use ice axes and learn about glaciers and the hazards they present. Return to the valley for the night. DAY 2: Today we’ll trek to a high mountain refuge in the morning and in the afternoon practise crevasse rescue and prepare for the next day’s climb before an early night in the refuge. DAY 3: We make an early start from the hut and watch the sun rise as we approach our climb up the Glacier du Tour. At the head of the glacier we cross over the Col du Tour to Switzerland and the Trient Glacier where a short traverse leads to the foot of the Aiguille du Tour and the climbing begins. We’ll make the ascent of the classic route on the Aiguille du Tour with summit views across to the high peaks of the Swiss Valais and the Mont Blanc Massif. We’ll descend back the same way to the valley and debrief over a well-earnt drink. This is an example itinerary and is subject to change depending on prevailing weather and mountain conditions. The course and objectives can be changed to cater for clients with previous rock climbing experience. Suitability: This course is designed at an entry-level so is appropriate for people with no previous mountaineering experience. The course will be physically demanding so you should be prepared for three days in the mountains ascending up to 1200 vertical metres on the summit day whilst carrying a pack. This six day course is designed to take climbers with previous Alpine experience and give you the confidence and skills you need to safely climb in the mountains and find your own way – to help you achieve your alpine goals whether you are fairly new to Alpine climbing or wanting the skills to tackle your first north face. Prior to the course we will discuss your previous climbing and mountaineering experience which allows me to tailor the course to deliver exactly what you hope to achieve and aspire to. No course follows a set 'formula'; they will be customised to give you the best learning experience whilst making the most of the current conditions in the mountains. If you haven’t climbed in the Alps before have a look at the Introduction to Alpinism course. Topics covered include: Planning and assessing the conditions to make a safe route choice and how to choose the appropriate equipment for a particular climb. Different rope systems for roped glacial travel, navigating on glaciated terrain, advanced crevasse rescue, snow anchors, bivouacs and how to contact the emergency services. Different rope systems for moving on Alpine terrain, short-roping, long-roping and moving together and when appropriate to use each method. You will learn how to protect the team using the terrain, rock and ice protection and also how to move safely on exposed ridges whilst protecting the team. The aim of this course is that after the first 3 days of training you will plan appropriate climbs for the final 3 days under the watchful eye of your guide and lead these with input and coaching from the guide. Ideally you will stay in the Alps after this course so you can consolidate your learnings with another route. This course will be run in the mountains as a progressive journey with as much learning as possible in a practical context. Suitability: This course is designed for people with previous mountaineering experience who wish to lead in the mountains on their own and with their peers. The course will be physically demanding so you should be prepared for six days in the mountains ascending up to 1200 vertical metres a day whilst carrying an alpine pack. This is not an introductory course. Climbers with very little or no Alpine experience should have a look at the Introduction to Alpinism course. Arrangement of mountain huts for the course itinerary, although you may do this for ‘your lead’! Ice axe, crampons, harness and helmet can be provided for a hire fee of £10/€15 per day. Mountaineering boot hire can be arranged with Snell Sports in Chamonix. Thousands of people climb but only a very few of them ice climb. This is the ‘dark side’ of the sport but there is something very special and satisfying about climbing frozen waterfalls, relying on your skill to efficiently progress, resting where you can and going for it up steeper sections. Starting out ice climbing can be intimidating as it is very different to rock climbing. Over the course of the three days, you will learn about the specific equipment and techniques for climbing water ice in a safe and progressive way and climb several challenging icefalls in beautiful Alpine valleys. Bruce and Scott putting the training to the test on steep ice! DAY 1: 0830 briefing and kit check, provision of hire equipment. We’ll then head to an area where we learn how to front point and place our ice axes. It will seem pretty tough at first but after a few climbs it will start to feel more natural. Venues for today could be La Cremerie in Argentiere or Le Buet. DAY 2: Hopefully your arms aren’t too worked after yesterday’s introduction as today we’ll head out to find some slightly steeper and more varied ice where we can develop our crampon technique and work on placing our axes more efficiently to save energy. You’ll learn to read the ice as you climb so you can rest and recover better to conserve your power for the harder sections. DAY 3: Today is an adventure day to pull together all the skills you’ve learnt on the previous two days. We may find ourselves climbing a steep cascade under the snout of a huge glacier or could day trip to hidden icefalls in a stunning Italian valley. By the end of today you’ll likely have sore arms but it’ll be worth it with your end of trip Italian coffee or beer and a big smile on your face! Suitability: No previous ice climbing experience is necessary but previous climbing or mountaineering experience is definitely beneficial. You will learn all the necessary techniques on this course. Ice climbing is strenuous and you use your whole body so be prepared for three physically demanding days. Technical ice axes, leashes, forged point crampons, harness and helmet can be provided for a hire fee of £15/€20 per day. Mountaineering boot hire can be arranged with Snell Sports in Chamonix. Europe is home to some of the best ice climbing in the world with the best venues being Cogne (Italy), La Grave (France), Kandersteg (Switzerland) and Rjukan (Norway). Trips can be arranged to any of these venues and others catering for all grades through to WI 6+. These days will be catered to your level and ambitions and can be purely guided ascents or progressive days learning to lead with technical coaching. Multi-day trips to venues other than Chamonix can be arranged. Please get in touch to discuss and put together a trip. Suitability: Previous ice climbing experience is beneficial to get the most out of these days and we can focus on developing technical skill if desired. The aim will be to climb a good amount of water ice daily aiming for maximum pleasure and quality. 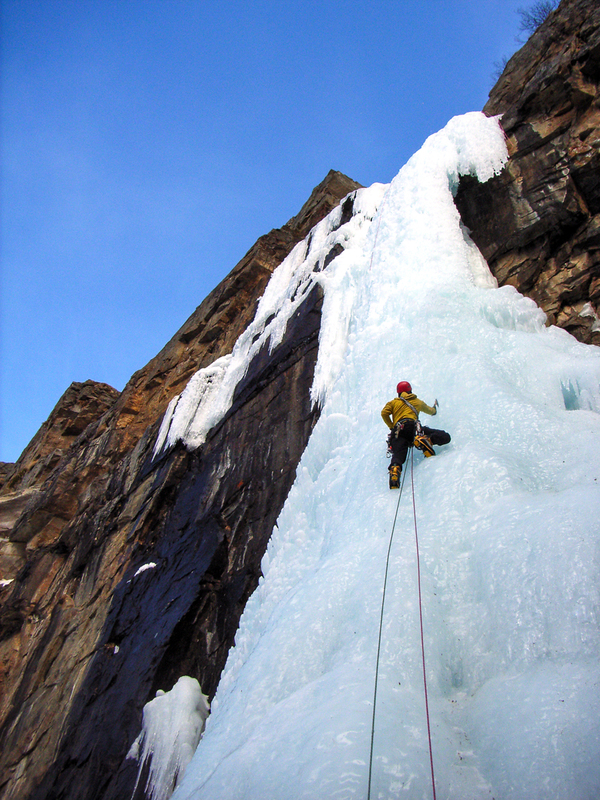 Ice climbing is strenuous and a ‘whole body workout’ so be prepared for physically demanding days.